Scopus. Publication data recorded in Experts as “research output” is maintained via an automated weekly update. Banner. Researcher names, faculty ranks/job titles, unit affiliations, and email addresses are updated weekly. Codebook. Unit names and relations are updated as needed. Illinois Data Bank. 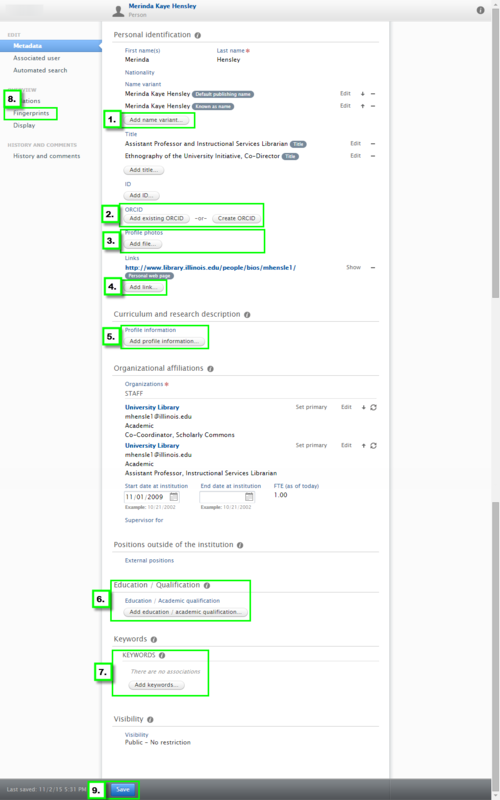 As part of the dataset deposit workflow, dataset citations are created in Experts once the IDB deposit is complete. Additionally, nearly 9,000 publication records (books, book chapters, non-Scopus-indexed journal articles) have been manually entered by the project team as part of an ongoing effort to supplement the information found in profiles for humanities, arts, and social sciences faculty. Units may also assign staff delegates to help manage or supplement the information in Experts on behalf of their affiliated researchers. Planning to include grants and patents data from campus sources is underway. How often is profile information updated? 1. Log in to Illinois Experts using your NetID and active directory password. 2. Click on the “edit profile” button next to your profile photo/avatar to open the profile editing window. 2. 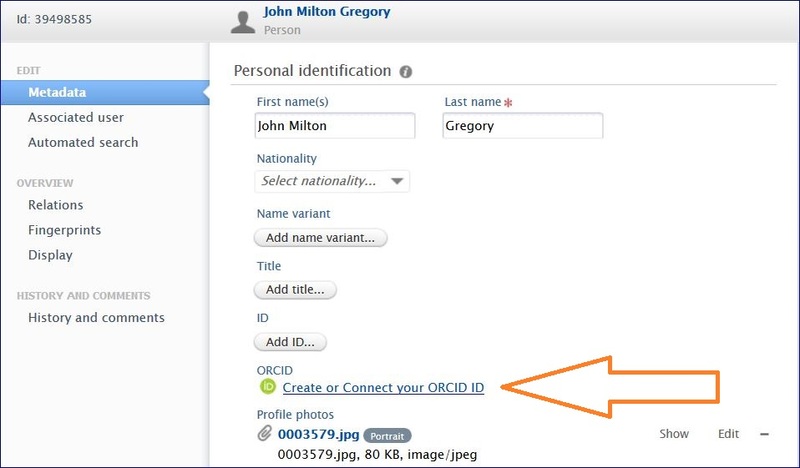 ORCID iD From within your Experts profile, you can create an ORCID iD (or connect to an existing one). Learn more. 4. Links Use your Experts profile to direct others to your lab or personal pages, other profiles (LinkedIn, ResearchGate, Mendeley, etc. ), or social media. 5. Research description You may add free text information about your research interests, teaching experience, creative works, selected presentations, and more. Note: text added as the “Research Interests” or “Creative/Performing Interests” type will be factored into the fingerprint. Learn more. 6. Education/academic qualification Do not enter information into this section. Instead, if you wish to list your educational credentials in your profile, add this information in the “Curriculum & research description” section. 7. 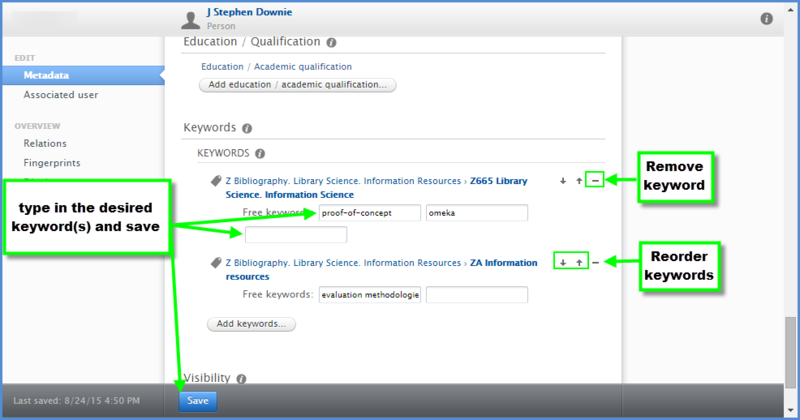 Keywords ● Improve your profile’s discoverability by adding free form keywords or from available taxonomies. Learn more. 8.Fingerprint ● You can suppress terms from your profile fingerprint, but cannot add terms directly. Learn more. 5. Changes made to the profile will generally appear on the public portal within a few minutes. However, in rare cases, it may take up to a day for the changes to appear. 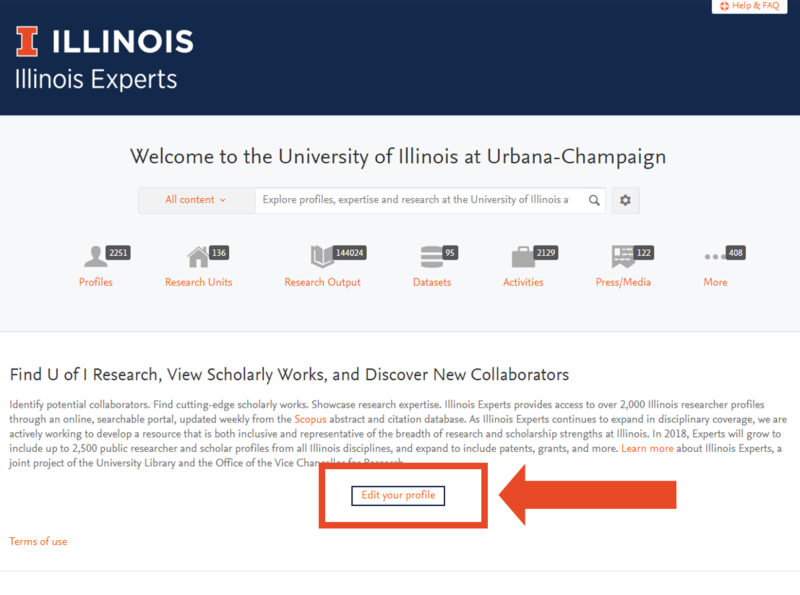 If you have questions about your profile, please contact Illinois Experts staff at experts-help@illinois.edu. How do I modify the research fingerprint displayed in my profile? 3. To suppress an entire set of concepts, use the on/off toggle located to the right of each concept heading. 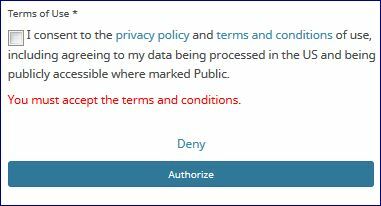 Click individual terms to hide them. 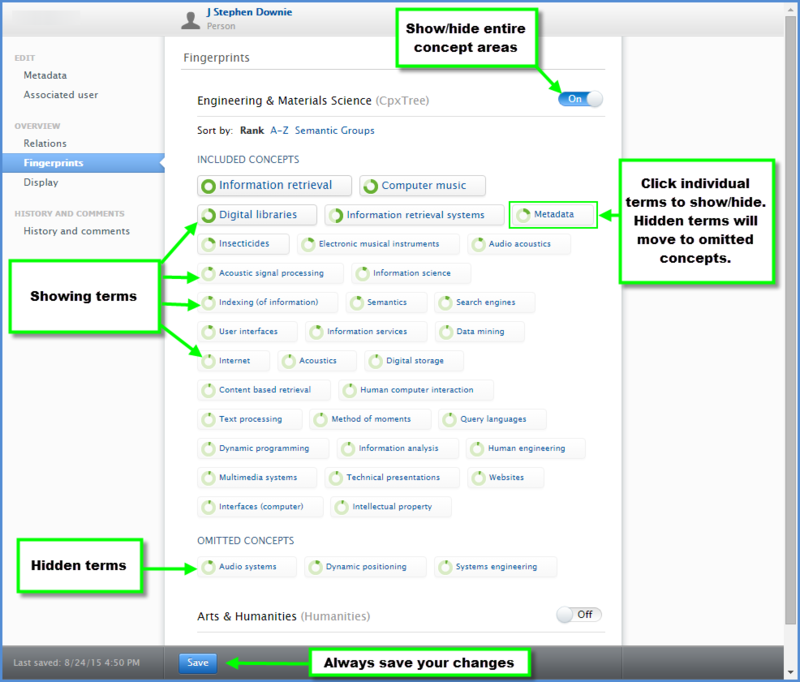 The hidden terms will move to the bottom of the concept area underneath the title “omitted concepts.” To show omitted concepts, click the desired terms. The terms will move back to their appropriate location in the fingerprint. 1. Although you can suppress concepts from your profile fingerprint, you cannot add terms directly. You can, however, influence the fingerprint by adding a “Research Interests” or “Creative/Performing Interests” statement to the “Curriculum and research description” section of your profile. Learn more. 2. Note that changes to the fingerprint resulting from the addition of a “Research Interests” or “Creative/Performing Interests” statement will not appear immediately. The new material will be factored into the fingerprint during the next scheduled fingerprinting process. How do I connect my other profiles or social media to my Experts profile? You may have other online profiles, social media accounts, or a personally-designed website that you’ve put a lot of effort into. Help guide others to those resources by linking to them from your Experts profile! 1. 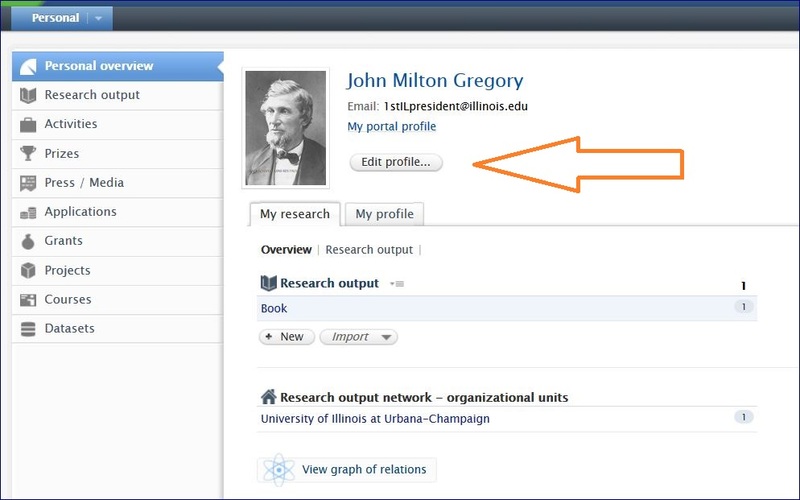 Log in to Illinois Experts using your NetID and active directory password. 1. 2. Click on the “edit profile” button next to your profile photo/avatar. 3. Click the “add link” button. 4. Add the URL for the intended profile, social media, or website. 5. Select a link type (LinkedIn, ResearchGate, Twitter, Facebook, etc.) from the drop-down list. 6. Click the blue “create” button. 7. Click the blue “save” button at the bottom of the window. How do I add keywords to my profile? 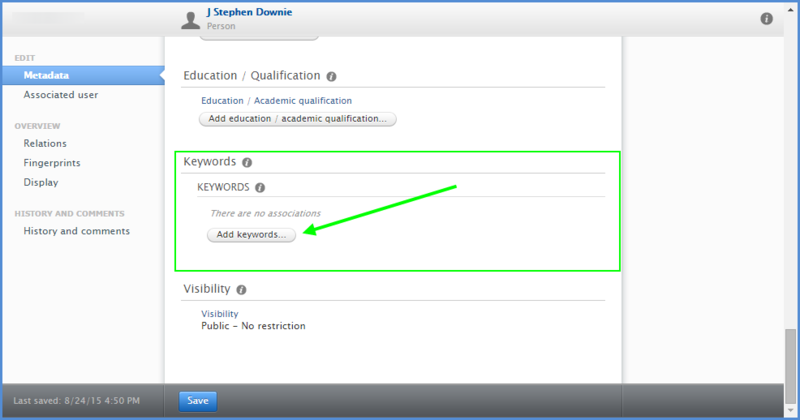 To increase discoverability, consider adding keyword terms to your profile. Note that keywords are not the same as fingerprint concepts (see here for information on fingerprints). 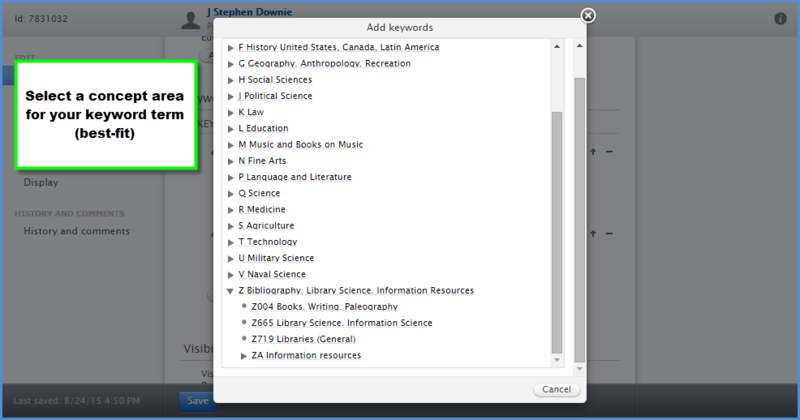 Free-text searches for keyword terms will help point users to you and your research. 4. Select the a best-fit concept area for your desired keyword in the pop-up window. 5. Type in the desired keyword(s) and save. 6. Be sure to click the blue Save button before you finish. Is there a way to turn off the collaboration map that currently appears in my profile? Changes made to the profile will generally appear on the public portal within a few minutes. However, in rare cases, it may take up to a day for the changes to appear. Where has the publication information listed in my profile come from? The majority of publication information in Illinois Experts comes from Elsevier’s Scopus citation and abstract database. An automated connection to Scopus provides Experts with a weekly update of new publication information, alleviating the need for researchers or support staff to make manual updates. However, although Scopus is the largest index of peer-reviewed literature, publication coverage varies among disciplines. Therefore, to date the project team has manually added nearly 9,000 publication records–primarily book, chapter, and non-Scopus-indexed journal articles–to supplement the automated information in profiles for faculty in the humanities, arts, and social sciences. How do I add a publication that’s not currently listed in my profile? 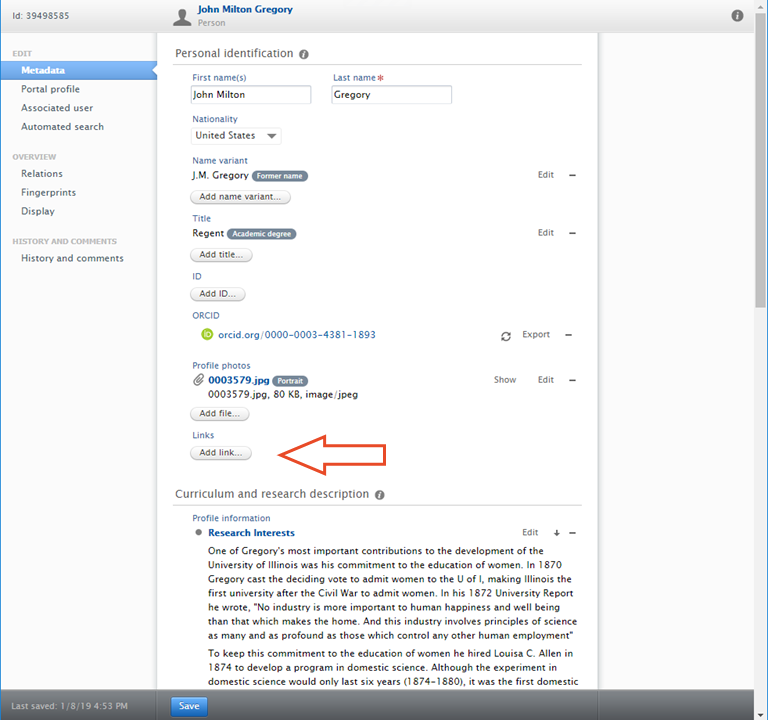 If the work in question has been published recently, it may soon be added to your profile automatically as an import from the Scopus database. In this case, it is recommended to wait for the automated update to avoid duplicate records being created in the profile. Note: it may take 4 to 6 weeks from the date of publication for the work to be indexed in Scopus and then pushed out to Experts. 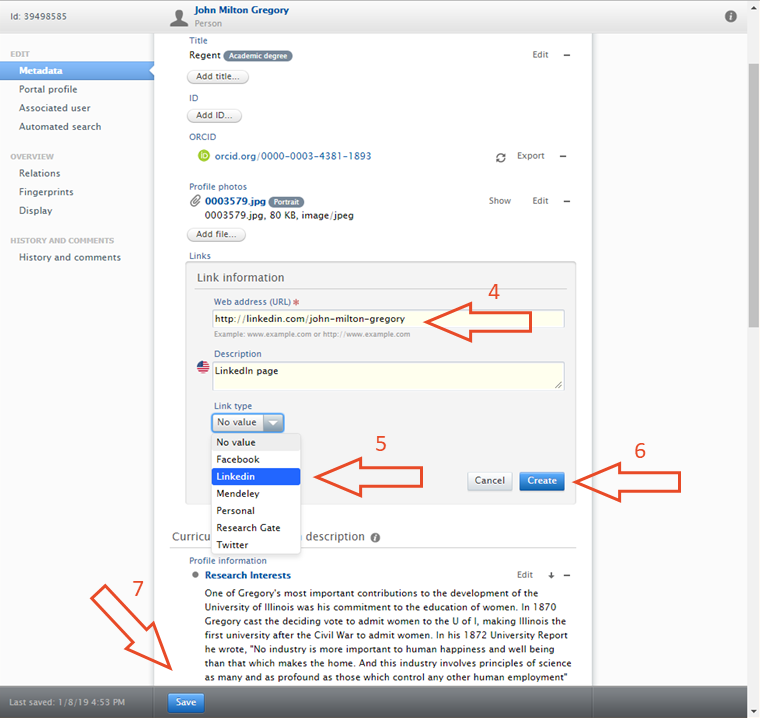 Although there are several options (including use of a template or importing from a file or an online source) for researchers to add publications to their profile, we recommend contacting the project team to assist with the entry of publications so that available metadata can be gathered and formatted appropriately. How do I edit publication information that’s currently in my profile? Most publication data in Illinois Experts has been gathered from authoritative sources, such as the Scopus citation and abstract database. However, it is possible that errors or incomplete data may appear in the publication record found in Experts. If this is the case, we recommend contacting the project team for assistance in correcting the error, especially as that error may affect other records in Experts. How do I remove a duplicate publication record from my profile? Deleting the record is not recommended because that may not resolve the issue that led to the duplicate record in the first place. If a duplicate record appears in the profile, we recommend contacting the project team for assistance in resolving the duplicate records. How do I highlight a work so that it appears at the top of my list of publications? Log in to Illinois Experts using your NetID and active directory password. Click on the “edit profile” button next to your profile photo/avatar to open the profile editing window. 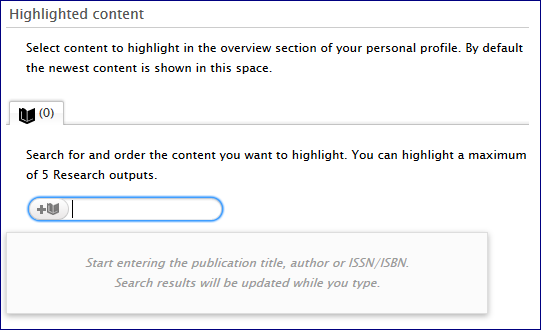 Select “Highlighted content” in the menu on the left side of the editing window. Select the open-book icon and click the plus button to open a search bar. Begin typing the title of the desired work, and then select that work from the resulting list. Repeat step 5 to highlight additional works (a maximum of 5 may be selected). Click the “save” button before closing the editing window. Other types of content (activities, honors, press/media items, etc.) may also be highlighted in this way. Although changes will generally appear on the public portal within a few minutes, in rare cases it may take up to a day for the changes to appear. Highlighted content will only be prioritized on the lists that appear in the profile overview. NOTE: You may also add research outputs to your “favorites” so that you can easily find them while editing your profile (see below). To do this, click the star symbol next to each item in Pure. Please remember that this action is not the same as highlighting your content, and adding items to your favorites will not affect your profile on the public portal at all. What other content can be added to my profile? Other types of content that can be added to the profile include activities (presentations and invited lectures, editorial positions, other service-related activities), honors, and press/media items covering the researcher or their research. All records of this type will need to be created manually, either by the researcher or by someone appointed by their unit to assist with this task. Click on the “Add new” button that appears in the upper-right corner of the screen. Select the desired content type and then an appropriate sub-template. 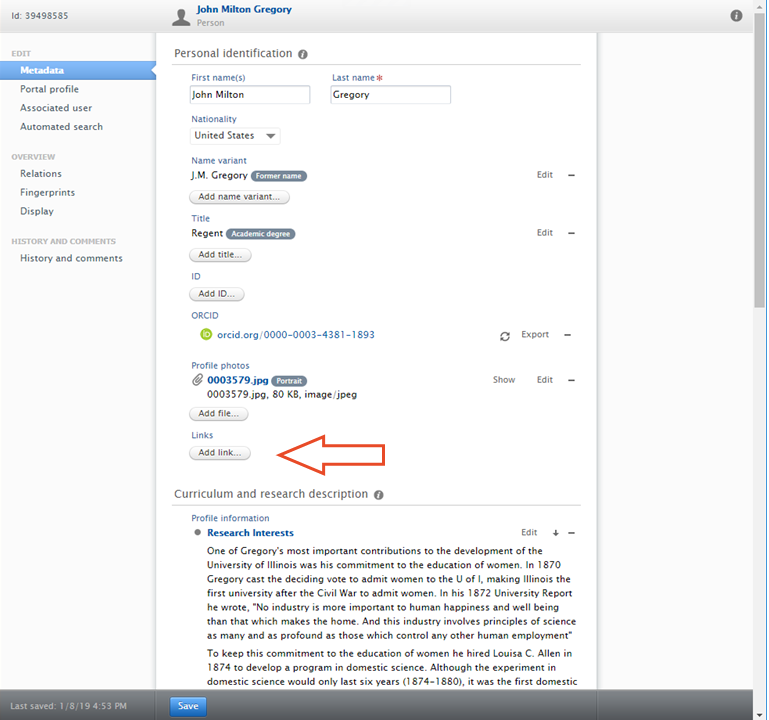 Enter the required information (fields marked with *) and click the “Save” button. Are you planning to include grants, patents, or other information in my profile? Yes, we are currently working on a process to gather information on grants, patents, and other information from various campus systems and load it into Experts in such a way to prevent the need for manual re-entry of that information. More details will be available soon. My unit would like to assign a staff member to maintain or add content to our faculty’s profiles. How can we do that? Multiple individuals may be assigned as delegates for a unit. For example, the editor of research output role might be requested for a unit librarian, and the editor of press/media role might be requested for a communications official. an acknowledgement from your unit’s executive officer indicating their approval of the request. Is there training available for unit delegates? Yes! After we’ve received the request to set up a user account for a unit delegate, and the approval of that unit’s executive officer, we’ll send the unit delegate their log-in credentials and a brief user guide for viewing and adding records in the Experts database. We will also gladly arrange for personalized training, if desired, at that time. My unit would like to learn more about Illinois Experts. Is someone available to meet with us? Yes, we will be happy to meet with your unit to discuss Illinois Experts. To request a presentation, please complete the form below. Does Illinois Experts have a web service API? 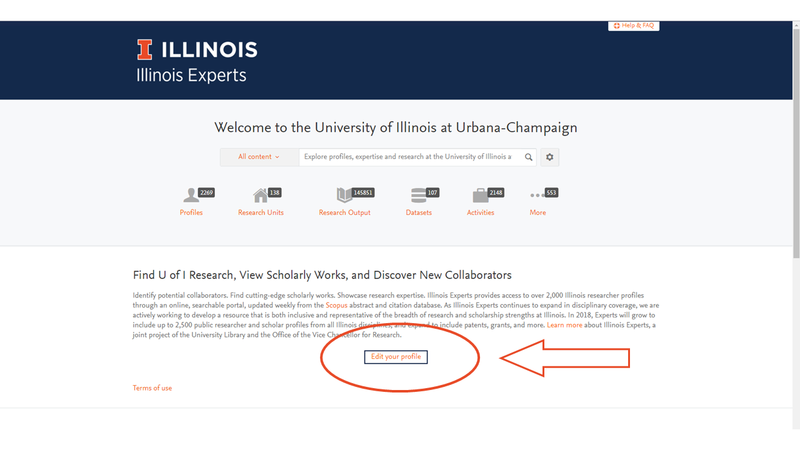 The software (Elsevier Pure) that powers Illinois Experts offers an API to support extraction of Illinois Experts data for use with other campus systems. Any information publicly available in Illinois Experts can be extracted, including fingerprint concepts. Example use cases for the web service API include web page updates, directory updates, and populating a local profile system. Documentation on the most recent version of the web service API is available at https://experts.illinois.edu/ws/ . To obtain an API key, please contact experts-help@illinois.edu with your name, unit, and a brief description of intended API usage.